Alarmingly, it is almost a month since I posted anything into this blog! That reflects a period of time when I’ve been preoccupied with some family activities and OCA Student Association work. However, my course work has made a little bit of progress and here I want to write up the exercise that requires me to experiment with layouts. 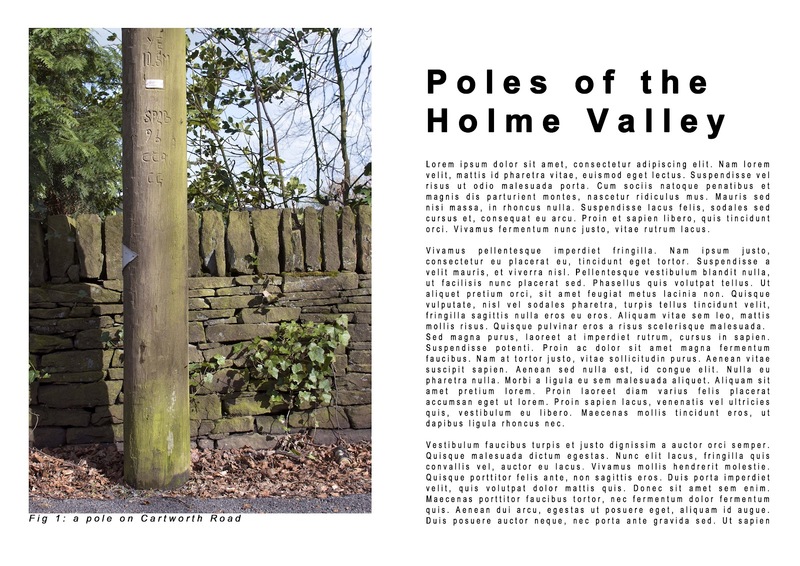 The course notes supply a ‘mock-up’ comprising an image (represented in the notes by a grey, ‘portrait-oriented’ rectangle); a caption (beneath the ‘image’); a heading; and some text. 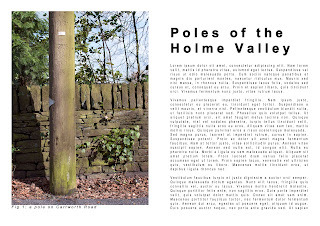 We’re asked to experiment with typefaces, italics, bold, etc, to produce three different versions of this layout. Clearly, this exercise is kept deliberately vague in order to encourage me to explore and experiment in Photoshop, which I have done. I deliberately went for a very simple approach first, just to get an initial feel for what I was doing. 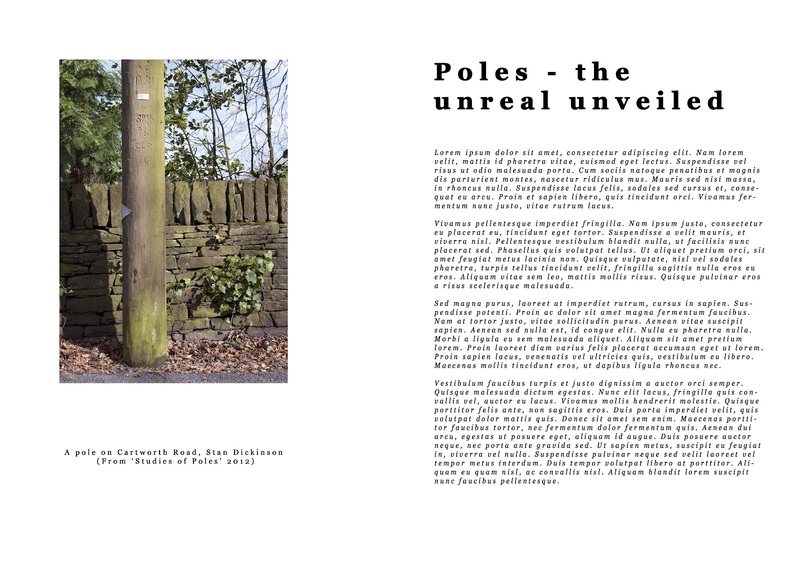 I did decide to use an actual image, so that I had some sort of concept to work with, and this first version is, I would suggest, something like a somewhat unsophisticated journal for those with an ‘academic’ interest in telegraph poles. This basic start raised some of the very basic questions of layout. · What crop of image is going to work on the page? Which leads to questions about margin size and so on. · When it comes to creating boxes for text, there are some basic issues about font size and its relationship to the text box, rest of page, and so on. With caption, heading and text, there are three quite different functions to perform. · How much text will actually fit onto a page? How will the paragraphs be laid out? What spacing? As I’ve said, this first version is kept very simple just explore these basic issues and the outcome is decidedly unsophisticated. The block paragraphs in a non-serif font (Arial) would actually be quite challenge to read. As I was doing it, I had the feeling that this ‘simple’ font would be most effective, but it certainly isn’t. Another basic issue – I didn’t ask for hyphenation, so the software has split up words across the lines. It looks quite neat at first glance, but it would be almost impossible to read! In the second version, I decided to pick up on some of these issues and to go for something more like a Fine Art journal. There is much more white space around the image on the left, in line with common practice in such publications. I’ve gone for a serif font (Georgia), which does work better, I think, although my use of italics (intended to give it a more ‘arty feel’) maybe pushes it too far. Then I’ve gone with left-justification, double spacing between paragraphs, and hyphenation, all of which creates more of a flowing, poetic feel to it. There is still maybe a bit too much text here, on the right hand page, for an art journal, but the layout does feel as though it has had a bit more thought than the first effort. Which leads me to version three, where I have deliberately been rather more experimental. This has been done with half an eye on the forthcoming book cover assignment. · White text on a dark background. In assessing the three, one has to say that it’s horses for courses, as in so many situations. 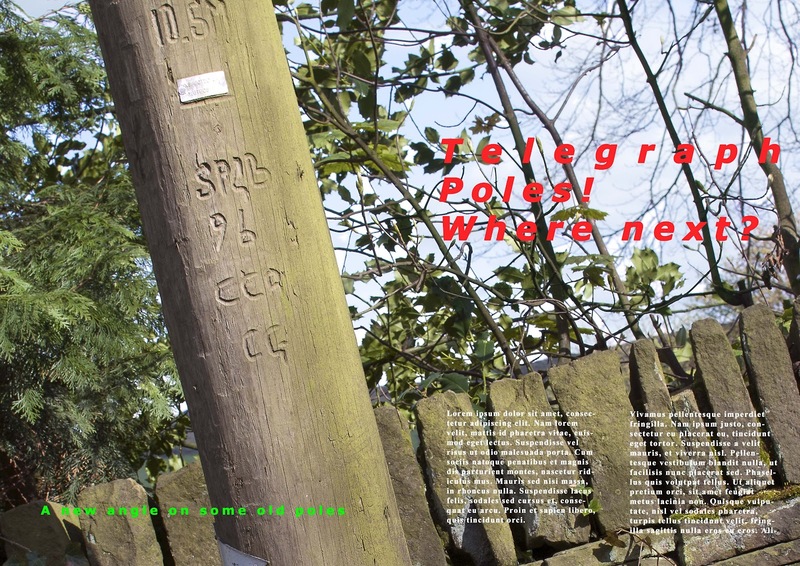 The first, very simple version, would definitely not work in a popular magazine for the mass market – but telegraph pole enthusiasts might well be riveted, whatever the layout! The third version shows what can be done, even with a limited level of knowledge and creativity, but there is real scope for getting it wrong – as with the excessive use of bright colours and the dangerous territory of white text on a dark background. I know, from previous experience with printed recruitment advertisements, that this can go seriously wrong and produce unreadable copy. I havn’t got the balance right between the two columns of text, either. I get the feeling that Photoshop isn’t brilliant for setting out a lot of text – which is why there is specialist publishing and layout software around. I don’t have the time to look at it in further detail, but I suspect that setting up your text/layout elsewhere and then bringing it into Photoshop as an image/file is probably possible and preferable. It’s been a useful exercise, however, and should have set up the basics for me to do the book cover layout assignment, since that isn’t likely to involve much more text than is in my third version above.